"Cooked ham and pineapple chunks threaded onto skewers and coated with a zesty, sweet glaze." Very simple to make (used George Froman grill) and pairs really well with white rice. Excellent recipe!!!!! Delicious!!!! 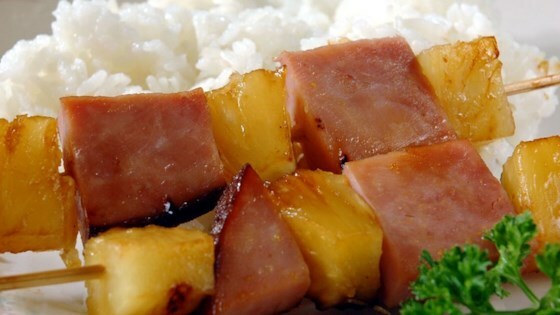 I used a honey roasted ham and fresh pineapple instead of canned..... I got rave reviews!!! Thanks for the recipe.... very simple and easy to make and cook! Very good! I brushed on the sauce at the end to keep it from burning. Pineapple on the grill, yummmmm! This one is a keeper too! Very easy to make. Whole family loved it.